We didn’t have to have our bags out until 8:15am. We had a good breakfast and left the hotel at 8:15 for our trip to the Alhambra. 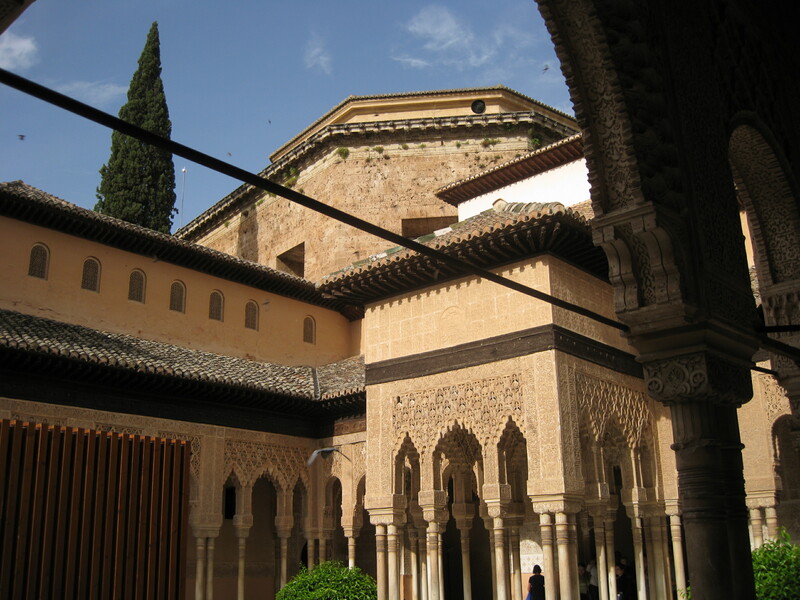 Granada came to prominence in the 1200s at the peak of Muslim power. 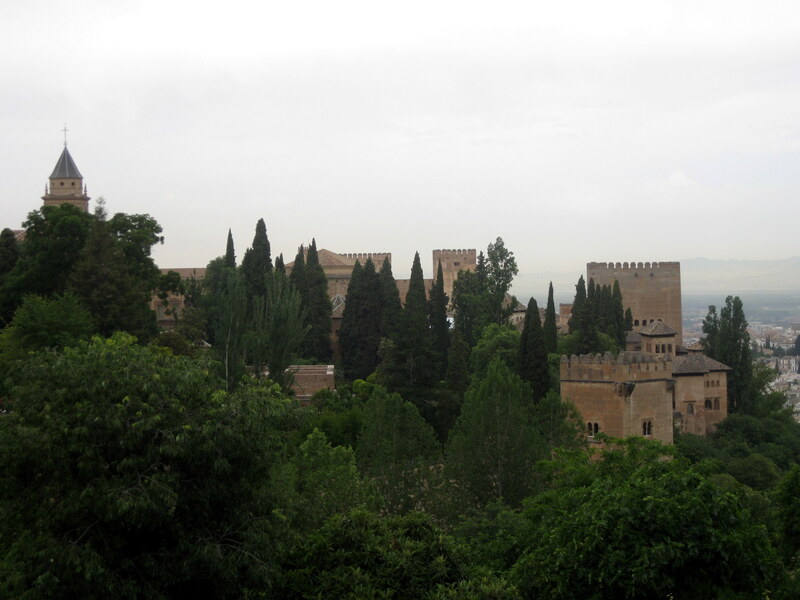 Even after Seville and Córdoba had fallen to Ferdinand and Isabella, the Catholic Monarchs, Granada stood as the last surviving Islamic capital in Spain. It's where the sultans took their last stand against the Catholic invaders. Fleeing Seville and Córdoba, thousands of Moors flocked to this last stronghold. 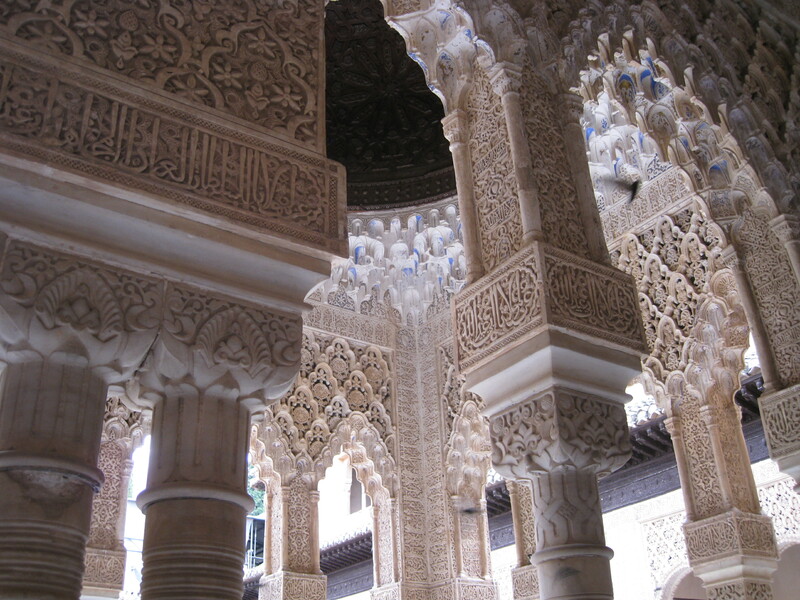 Many of them were artisans, and the Alhambra and other buildings testify to their skills. 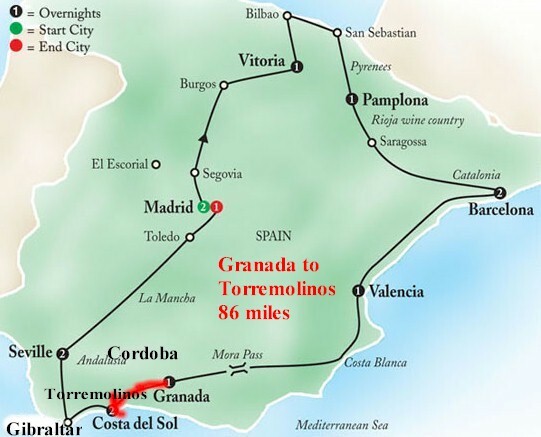 On January 2, 1492, Granada surrendered to the Catholics Monarchs, when Boabdil, the last of the Moorish kings, turned his beloved city over to Ferdinand and Isabella. Isabella immediately began to "Christianize" Granada. 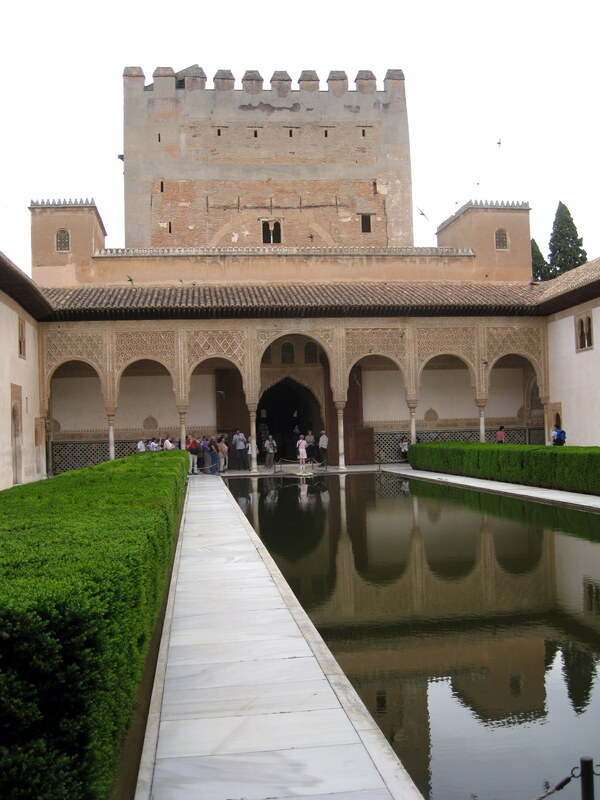 The name Alhambra comes from the Arabic word qalat-al-hamra, which means “red”, “red castle”. The first theory about this meaning would be based on the reddish color of the adobe bricks. However, it is thought that the walls were white and that their color comes from the reflection of the torches at night. The Alhambra was built by the Nasrid Emirs of the Kingdom of Granada in the last period of the history of Muslins rule on the Peninsula. It was a fortified city of 341,207 square feet consisting of temples, hermitages, cemeteries, private homes, palaces, universities, guest houses, marketplaces, hospitals, fortresses, 30 towers and access gates. Many of these buildings have now disappeared. We had an excellent tour of almost the entire complex. The rooms and gardens were quite lovely. I bought a book, Granada and the Alhambra, which gives many pictures and details. It would be too much for me to write on this site. When the bus returned to our bus stop at the Alhambra, it contained our luggage so we didn’t have to go back to the hotel. 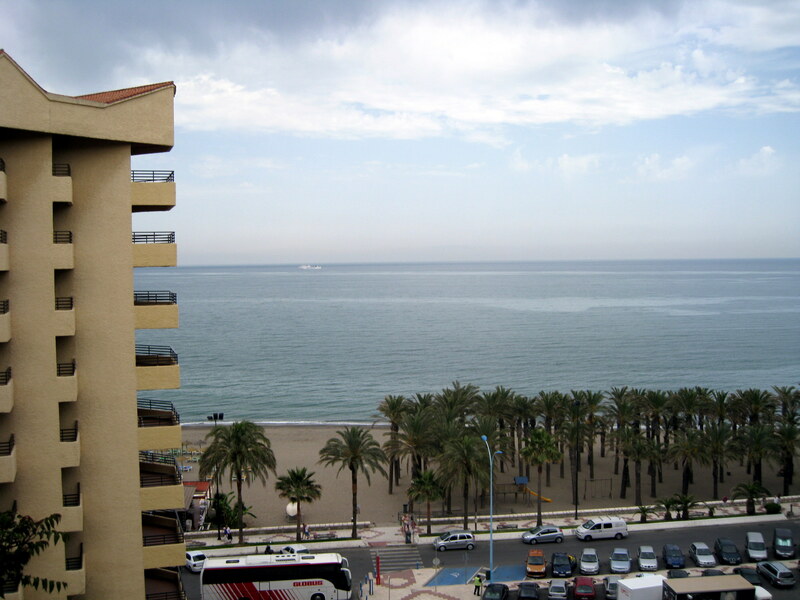 Next we drove to Torremolinos, a beach town on the Costa del Sol, arriving about 1:00. 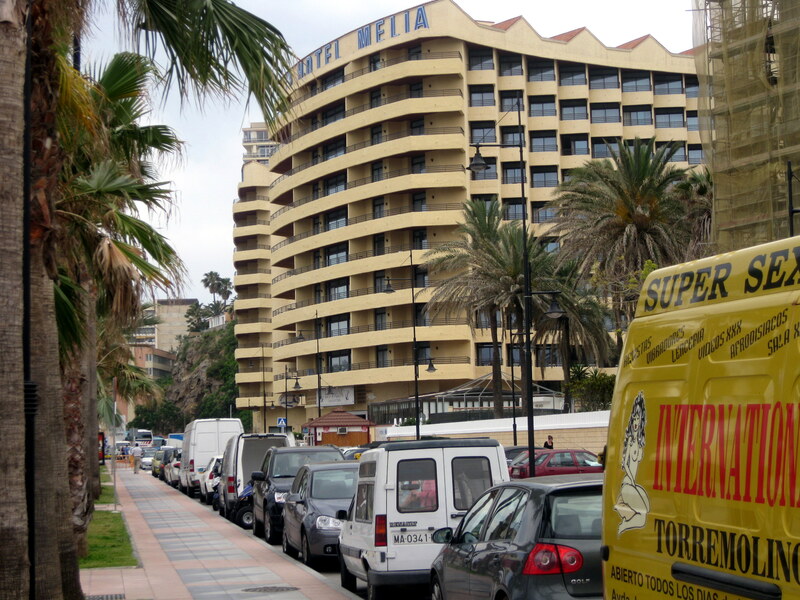 We stayed in the Melia Costa Del Sol hotel, which was rather new and quite large. We had a nice room with a private balcony. After checking in, we were on our own for lunch. All along the beach were little restaurants. Kaye, our guide, had told us that the older restaurants were better than the new ones….they had been there for a long time whereas some of the newer ones changed ownership frequently. The older and newer alternated along the boardwalk. We found one of the older ones for our lunch. I had a shrimp sandwich and my wife had a shrimp omelet. I had miscounted one of my medications before leaving and was running very low. We always carry a letter from our doctor which lists our prescription drugs. We went a local drug store on the beach level (there is the beach with a boardwalk, hotels, restaurants and some shops. The main town is on top of the hill). The pharmacists had no problem with ordering the medication for me. I would advise everyone who travels to take such a list from your doctor. You never know when you might need it. This morning I broke one of the prongs off my electric converter. So we started looking for a new one. We tried the local grocery where we did find gin and tonic water, and tooth paste. Why look further! To get to the town above, there is an elevator, a steep walkway or a taxi and maybe a bus. We took the elevator. The electric store was closed for siesta, so we walked around the town which we found plain and unattractive. There was no historic architecture of any significance. One of the things we wanted to check out was the local train to Malaga for the next morning's trip to Cordoba. We did find the train station. We found another electric store and the clerk said that we didn’t need a converter as most everything now ran both on 110 and 220. I would suggest you check your razors, battery and phone chargers to see if they will use both 100 and 220. Mine did. We stopped at a café and had orange juice. When we got back to the elevator we found that we had missed the last ride by five minutes. So we walked down the many, many steps to the beach level near our hotel. Back in our room, I enjoyed the balcony, looking at the Mediterranean and drinking a gin and tonic. What a life! My wife, as usual, took at nap. None of our meals except breakfast was included in this two day stay so we went back to the boardwalk to an “old place”, Restairacte La Paella. We had a delicious fish soup and then a salad. We ordered a paella which my wife said was the best she had had so far. We really had too much to eat, we should have skipped the soup and salad. We walked a little of our dinner off and went back to the hotel. 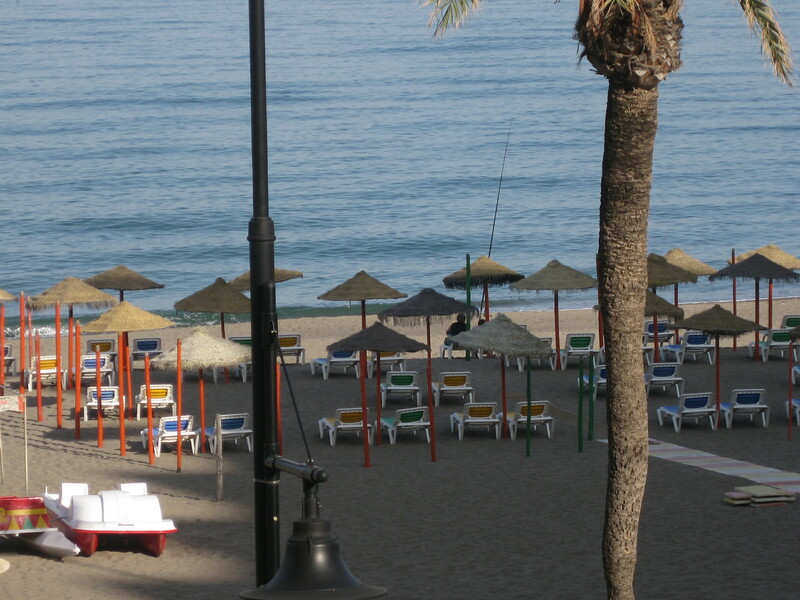 An incident happened to us is Torremolinos that we didn’t know about for over a year after it occurred. I write of this incident to advise you to be cautious with your money and credit cards especially when using an ATM machine. I use Quicken to track my finances and to pay my bills. I check my bank and credit card balances daily with this program. I also look at the corresponding ledger sheets that are shown daily from the various institutions. This past spring (2010) I noted on my wife’s checking account two charges of $1.00 and a $483 charge to a grocery store in Houston, Texas. We didn’t know how that happened. I looked my checking account ledger, and I had the same two $1.00 charges plus two $75.00 charges at gas stations for that day and the day before. We both had our bank cards, so we contacted our local bank and had both cards cancelled. We met with bank officials who questioned us about our use of our bank card as an ATM card. Both of us use our cards only at our local bank. In the past year we had not used the cards anywhere else except for our trip to Spain. We were asked if we had used both of our cards in any one town. Upon checking our records we found that we had both used our bank cards at two different ATM machines in Torremolinos. We had used one or the other card in several other cities, but nowhere had we used both cards in the same city. The bank officer (and since then many internet sites and newspaper articles) explained about skimmers being placed on ATM boxes that could read the magnetic strip on the back of the card. Small cameras are also attached that can read the pin numbers as they are entered. I have read that a camera can be installed at some distance from the machine and can read the pin numbers as you type them in. The conclusion was that our cards had been skimmed and our pin numbers recorded in Torremolinos. From the stolen information, new cards were made using the scanned information and the photographed pin number. Credit card skimming occurs frequently in Europe as well as the United States. The information is sold to individuals who make a new card with your bank card or credit card number and your pin number, not the name of your bank but one in the location where it will be used. If we did not checked our bank ledgers on a daily basis, our bank account could have been wiped out in a few days. We understand that several cars will pull into self service gas stations and the hose is passed around thus running up a $75.00 charge on one pump. So when you use a ATM machine not only while traveling but also at your local bank, check, and “pat” around the machine for any piece of equipment that looks suspicious and do not use that machine. Our bank official checks the ATM box every morning to see if any sticky material is adhered to the surface. ALWAYS PLACE YOU HAND OVER THE KEY PAD SO NO ONE CAN PHOTOGRAPH THE NUMBERS YOU ENTER. Report any suspicious looking machines to the bank officers. Inform credit card companies and the bank that you will be traveling in a foreign country or anywhere away from home. If you are traveling, as a couple, carry one credit card each on different banks plus your individual bank cards for ATM machines. Take only a driver’s license or other form of identification, medical insurance cards, a list of medications, passports and international driver’s license (if you need one) and an emergency contact list. Carry them in a safe place. I use a waist wallet under my clothes. I also have duplicates of the papers and carry them in a leather zip folder in my carry- on and store them in the room or hotel safe. In a separate place, take the numbers on the credit and bank cards with the telephone numbers of the institution in the event they are stolen. Leave your usual wallet with other cards at home either in the bank safety deposit box or a home safe. I carry a small tri-fold wallet in my front pants pocket and not my hip pocket. Wallets in hip pockets are an easy target and pickpockets are experts. I also use a waist wallet under my pants to carry the above information. My wife uses a pouch with a string around her neck with the pouch inside her blouse. Because of the exchange rate of the Euro, I ask my bank to increase our bank card limit to $500.00 daily. Most banks have a normal $300 limit when using your bank card as a credit card or ATM. The limit is much higher for using it as debit card. Our stolen card numbers were used as a debit cards. We never withdraw more than 250 Euros at a time from ATM machines which depending on the exchange rate is usually over $350 and the reason we ask for a limit increase. We never carry more than 100 Euros in cash on our person at anytime, usually dividing it, keeping only a small amount in our pocket and rest in our pouches. For small purchases, less than 20 Euros, we pay cash (snacks, small gifts etc). Larger purchases we always used a credit card. If you carry a large amount of cash and it is stolen, it is gone for good. If your credit card is stolen, you can immediately notify the company and further charges will be stopped plus you can generally have any illegal charges removed. Make use of the hotel room safe or hotel office safe, if there is not one in the room. In addition to important papers, we lock up one set of credit and bank cards and excess cash. We alternate the cards daily. On the day that we carry them I carry the credit card and my wife the bank card and visa versa. Several people lost money and credit cards from their rooms in Vitoria by not putting them in the safe. It only takes a minute to do this!! Be constantly aware of your surrounding and suspicious people. You can never be too cautious. One incident of pickpocketing can certainly ruin a wonderful trip and cause a lot of hardship in securing necessary funds to continue your vacation. Travelers often become careless and think that it won’t happen to them, but we have several friends that have had bad experiences losing their money and cards. As the old saying goes: “It is better to be safe than sorry”. Safe traveing!! !